Colorado’s cannabis industry and its fans should take note. A meeting Wednesday in Washington between Attorney General Jeff Sessions and Gov. John Hickenlooper suggests the federal crackdown we’ve been concerned about isn’t coming any time soon, and likely isn’t coming at all. Colorado Gov. John Hickenlooper, left, met Thursday in Washington D.C., with U.S. Attorney General Jeff Sessions. We’re thrilled at the news. Recently, we advocated for just such a meeting. 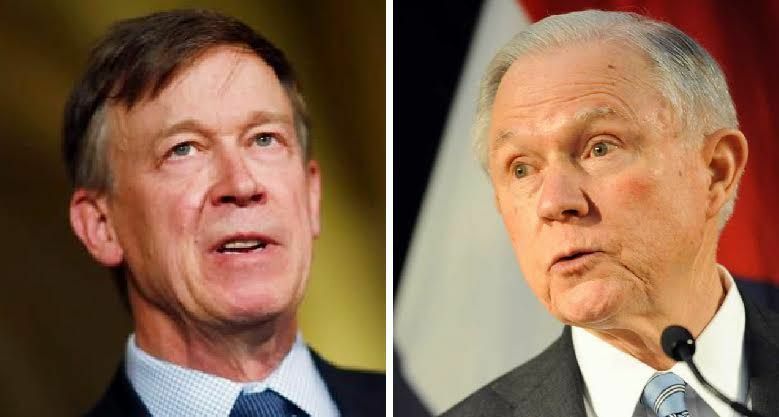 Hickenlooper was right to reach out to the attorney general, and Sessions was wise to hear him out. Yes, the law-and-order Sessions could change his mind. And President Donald Trump could get involved in unpredictable ways. It’s also possible we’re reading too much into the conversation. But the substance of the meeting in and of itself should comfort those worried about the chaos that would result if the feds decided to crash the Colorado experiment. Hickenlooper laid out the basics, noting that he worked against legalization here, but that he believes Colorado lawmakers and regulators have in place a good system that is getting better. The governor noted that we haven’t seen a rise in teenage use of the drug, that emergency room visits have decreased as laws regulating edibles have made the products safer and that the state worked this legislative session to tighten loopholes in grows that have seen large amounts of pot slipping into other states that haven’t legalized. The administration has sent mixed messages on pot-legal states. On the campaign trail Trump said he would leave the states alone. But White House spokesman Sean Spicer has said that there would be greater enforcement on recreational sales. To that point, Hickenlooper argued that a crackdown on recreational marijuana would lead us back to the days of massive use of medical marijuana, as recreational owners would switch to medical and we’ve all seen there are plenty of doctors willing to prescribe the drug. “You would just be trading one problem for another,” Friednash said, adding that such a change would only encourage more gray- and black-market conditions. Importantly, the governor and the attorney general ended the meeting positively. The pair agreed to share information to help inform federal decision-making and Sessions seemed interested in a visit to our fair state. Working together to get through this change in leadership is the better path. We hope the relationship grows and contributes to thoughtful and responsible review of the status quo.